This excerpt, from page 302, describes a time when my daughter Elena’s anorexia nervosa was once again taking control and she had moved back home with her father and me. I was worried sick and miserable about her. My two cats were taking advantage of the situation to escape into the backyard as often as they could. We lived on a very quiet street with no through traffic, but I felt they weren’t safe outside. My writing started to reflect my worries about Elena’s health and the cats’ safety. It’s no accident that today’s excerpt contains a dead cat. After a couple of hours, Elena would get up, blinking sleepily, wrap the fuzzy blanket around her middle, and shamble off to smoke a prenap cigarette on the patio. Would the cats be okay? It was just one more thing to worry about, but I couldn’t fight on every front at once. Joe, Martin, Elena, Simon and Tor, Valerie and Clint and the grandbaby . . . I was starting to have to pick my priorities, and Martin and the cats were losing. Martin was having to grow up. Last year had been the most successful writing year I’d had. I had brought in almost as much money as Joe did. But this year had been completely miserable. Martin’s first adventure had come out, but the publishing house had shoved it down a hole. They had done no marketing at all. Almost no one knew that his first book even existed. I didn’t feel it as a blow to me personally. I had never felt like a real author. But the thought of Martin and his dog Chip out there on their own, having the adventure of a lifetime . . . They should have had reader friends to go with them on that journey. First, I had failed to help Elena. Now I’d failed Martin, too, and my sadness over these failures soaked into his world. They didn’t change who Martin was, but they changed what happened to him. One afternoon, I sat at the kitchen table and sipped my coffee. My laptop was open, and I was rereading a marked-up Word file, working on some last-minute revisions. But I wasn’t seeing words. I was seeing what Martin was seeing. He was face-to-face with heartbreak and loss. Martin couldn’t make up his mind about the skeleton slumped over the table. One second, it seemed small and pitiful. The next, it seemed uncanny and horribly inhuman, and he wanted to smash it with the nearest heavy object he could find. Rudy had told him that the people who hadn’t gotten picked for the domed suburbs had lined up to be given euthanasia shots. Because skeletons were only people, after all—people who had faced the ultimate rejection and experienced the ultimate failure. Martin plucked up the courage to come closer. Dry brown skin encased the bony hand in a glove of its own making. It lay in that flattish nest of fur that was piled up in the basket. A pet basket to match the little paw print bowls in the kitchen. A cat bed. The pale fur belonged to a cat. A vision wove itself together in Martin’s mind of the house before the dust, when the neat row of potted plants in the kitchen had been green and flourishing. The world was ending, and people were forming long lines to get their shot. But this man with the paw print bowls couldn’t do that. What would happen to his cat? He couldn’t just put her outside and not come back. He loved her too much. So he gave his cat poison and stroked her until she lay still, and then he took poison himself. And the soft fur of his cat was the last thing he felt as he drifted away into death. Text copyright 2015 by Clare B. Dunkle; text courtesy of Chronicle Books. 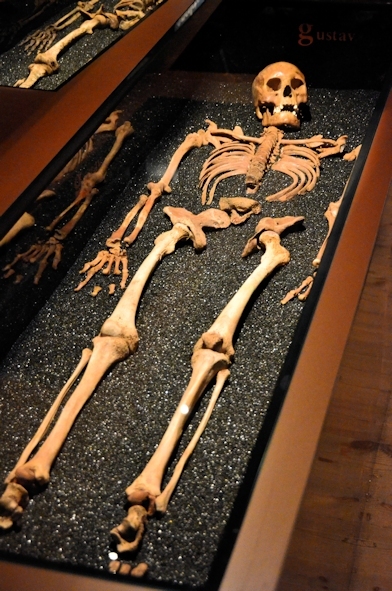 Photo of Gustav, victim of the Vasa shipwreck, Vasa Museum, Stockholm, Sweden, copyright 2015 by Joseph Dunkle. To read my latest blog posts, please click on the “Green and Pleasant Land” logo at the top of this page. This entry was posted in Anorexia nervosa, Characters, Publishing. Bookmark the permalink.